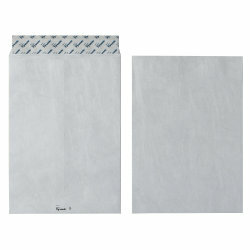 Tyvek Mailing Envelopes 11782. Seal: Plain Peel and Seal. Paperweight: 54 g/m_. Dimensions: Height 324 x Width 229 mm. Envelope Type: Format: C4. Colour: White. Sealed Air Protective Mailer D1. Envelope type: Plain. Seal: Self seal. Printed interior: No. Internal dimensions: H260 x W 180 mm. Qty: Pack 100. Jiffy Padded Bags MJIB01004. Details: Heavyweight protection. Dimensions: 164 x 285 mm. Colour: Brown. Quantity: 100 pieces.